Have you heard that National Cocoa Day is December 13th? That means it will be a good day to treat yourself to a decadent cup of hot cocoa with all the fixings. The timing is perfect. This is a busy holiday preparation week and you deserve to take a break, sit down, and wrap your hands around a steaming mug of chocolate. This post contains affiliate links for your convenience. When you shop using these links, I receive a small payment that helps support the costs to publish this blog. 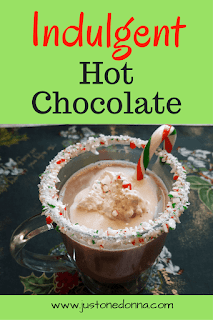 Making delicious hot chocolate at home surprisingly is easy and you probably have all the ingredients you need in your kitchen right now. The basics requirements are cocoa powder, sugar, and milk. You'll want a little flavoring, too. Vanilla extract is perfect, but feel free to add some Kahlua or Bailey's Irish Cream (or both) if you want to adultify your hot chocolate. If you want to jazz up your hot chocolate mug like I did, you'll want some white chocolate chips and some candy canes. Prepare your mugs in advance. Crush two candy canes in a zip top bag and place the pieces onto a small, shallow plate. I used a metal meat-pounding tool to crush the candy canes but you can use whatever tool you have handy. Place two ounces of white chocolate chips in a heat safe bowl and microwave on high for about one minute. Stir the chocolate at thirty seconds to get a feel for how much longer you will need to heat the chips. Check every fifteen seconds until the chips are melted. Stir well and pour the melted chocolate onto a small plate. Dip the rim of each mug into the melted chocolate to coat well. Then dip the mugs into the crushed candy cane. Set the mugs aside to allow the chocolate to harden. One caution: don't pour your hot cocoa into the mug up to the same level as the decorative white chocolate rim. The hot cocoa will melt the white chocolate and it will drip. Place the cocoa powder and sugar in a pot over medium-high heat. Add 1/3 cup of hot water and stir to combine well. Bring the mixture to a boil and cook for 2 minutes. Add the milk to the pot and heat until the desired drinking temperature. Pour into prepared mugs and add vanilla or liqueur to flavor as desired. 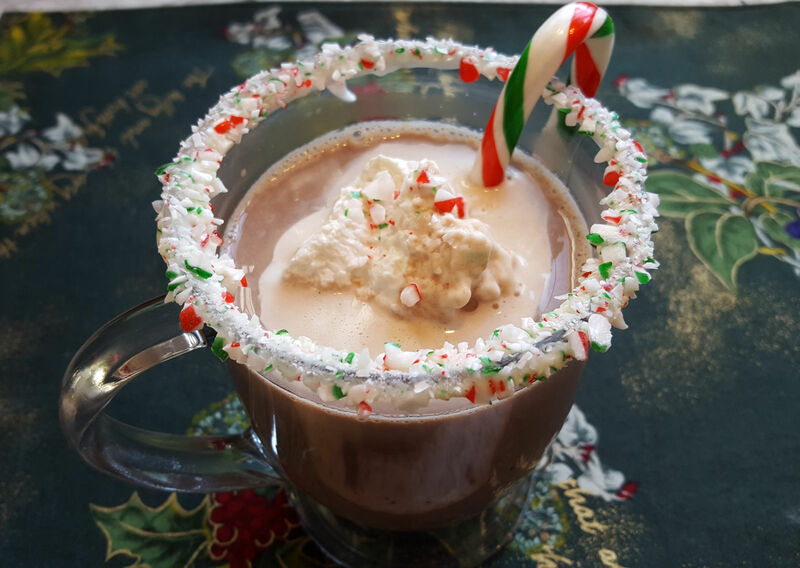 Top with a dollop of sweetened whipped cream and crushed candy cane sprinkles. Add a candy cane as a stirrer, if desired. Thank you for sharing this blog post with your friends on Facebook, Twitter, Pinterest, and Yummly. I appreciate your support.